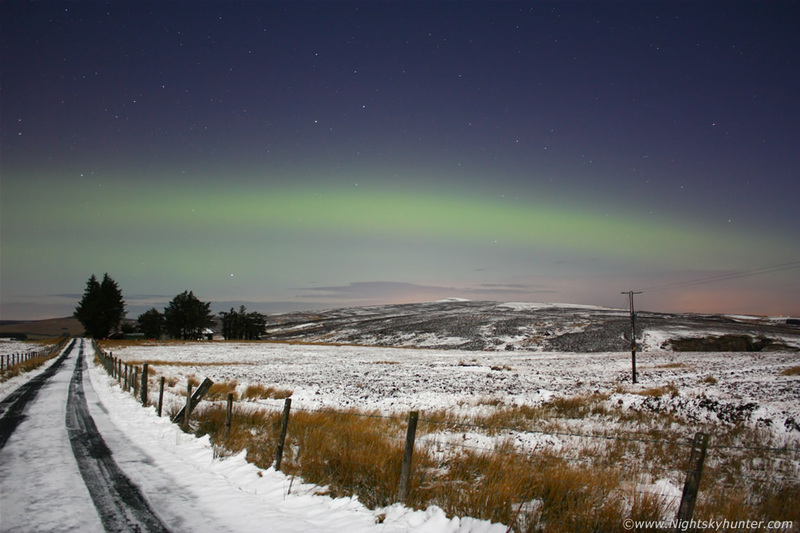 Beautiful green aurora display over the snow-covered Glenshane Pass outside Maghera, N. Ireland on Valentine's night, Feb 14th, 2011. The aurora sported a three tier structure of bright bands over 30 degrees high and a multitude of faint vertical rays. A bright gibbous Moon high in the S behind me lit up the snow like daylight which made for a great foreground to the active aurora above. This was a caused by the impact of a solar wind stream and CME from an M6.6-class solar flare which erupted from sunspot group 1158. Check out the report for more information and images.